When running any system, we should always care about how the system can recover from a disaster. It seems like that we read about a high profile website is crashed / hacked every day. So, we should always have a solid plan of backup and restore so that we do not lose anything in a rainy day. At phpFox, we support the backup and restore as a built-in feature of the platform. You can easily create a full backup of your community, or just choose several files to be backed up, and then distribute to other servers / services. In the future, you can restore the site from a backup if something goes wrong. Everything is quite simple with Backup and Restore application. 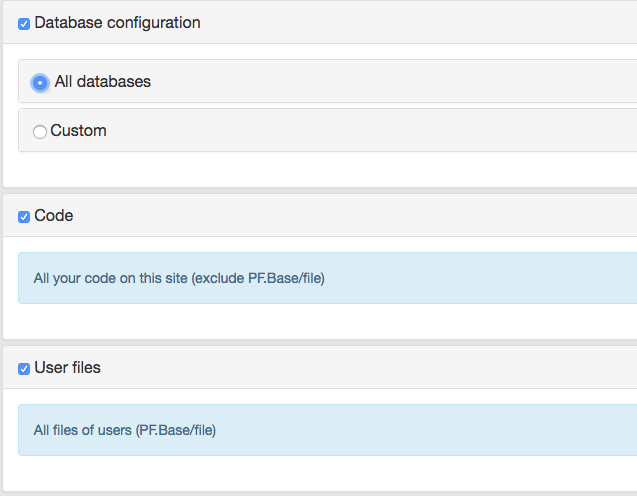 - Admin can select all or some specific tables when they backup database. - Support manual backup and schedule backup. - Notify to admin via email after backup successfully. - Admin can manage backup packages: view info, download, remove, restore. - The site will be put into maintenance mode while the backup is in the process. - Notify to admin via email after restore successfully. - The site will be put into maintenance mode while processing. - Support safe mode to restore (in case the site is broken).